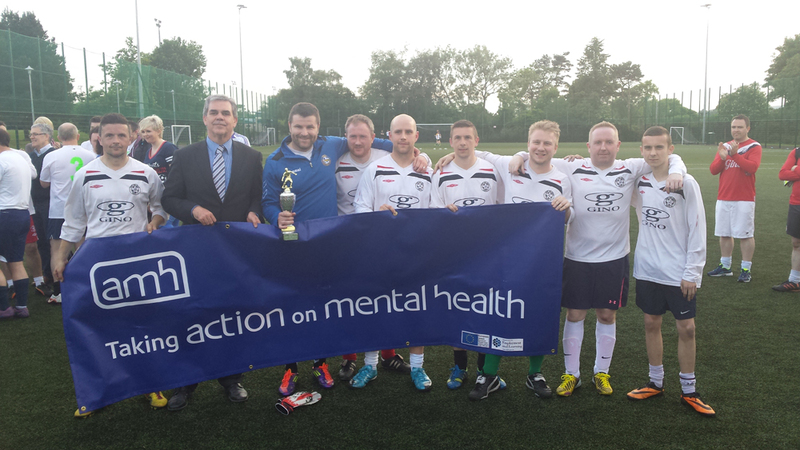 As the World Cup draws to a close, local amateur players from The Business Services Organisation (BSO) in Franklin Street, Belfast are celebrating their own success with the proceeds of their charity football match going to support local mental health services. Representatives of Action Mental Health are pictured presenting the charity’s “Heads Up” award to members of BSO. The group raised £1,118.10 at their event held on 6th June at the Dubs Pavillion on the Malone Road. AMH’s Head of Business Development Brian Murtagh presented the trophy to the winning team, the Family Practitioner Services (FPS), and thanked the group for choosing AMH as their benefactor.